"If you want to solve this problem, then I urge you to read this letter --- immediately!" Are your employees adjusting your computer's time or date? The truth is many companies don't have a clue about what their employees are doing to their computers. And when it comes to adjusting the time or date, it only takes about 3 seconds to do! 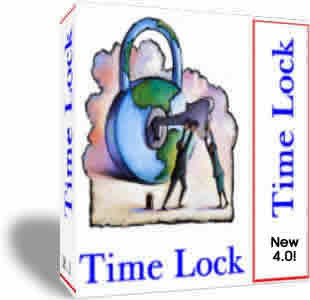 "Let Me Show You A Simple Way To Solve This Very Real Problem..." We developed the Time Lock software solution to prevent anyone from ever changing your computer's time or date without your permission. And it will work on everything from Windows 95 to Windows XP. "I have my employees use a computer based time clock system. With the Time Lock program, I now longer have to baby sit the computer. I know they are not able to pad their time cards!" keep others from changing the computer's time. keep others from changing the computer's date. you get several built in systems to accommodate every Windows operating system from Win 95 to Win XP. You can set your computer date and time from the Atomic Clock over any internet connection! If you'd like to try the program before buying, submit your first name and email below and we'll send you a download link in a few minutes! Upon purchasing, you will get an iron clad 90 day money back guarantee. If the program doesn't do what you expect it to then just send it back for a complete, 100%, no-hassle refund. It's that easy. Owning Time Lock is a simple, proven way for you to safely secure your computer's time so no one will change it's settings without your knowledge. Go ahead, try Time Lock at our risk. If it doesn't do the job for you, I want you to send it back so I can give you a complete, no-questions-asked refund!